Out of the numerous cosmetic anti ageing procedure techniques, using radiofrequency (RF) is gaining immense popularity worldwide. This innovative and completely non-invasive cosmetic treatment uses particular mono and bipolar radiofrequencies to enhance the natural production of collagen. This is helpful in improving the quality and tone of your skin remarkably. Using mono or bipolar radiofrequencies to enable better collagen production at the sub-dermal level is highly effective and an excellent anti ageing cosmetic solution. Am I an ideal candidate for cosmetic Twin Polar (Mono or Bipolar) Radiofrequencies procedure? You are noticing lines and wrinkles on your face and neck and wish to have them removed naturally. You wish to restore a fresh and youthful look on your face by improving the quality and tone of your skin. You wish to have better-defined cheeks and facial features. You wish to remove unwanted laugh-lines, marionette lines, dark circles and droopy skin from around your eyes. You are not pregnant, have no metal implants, are undergoing cancer treatment, suffer from epilepsy, coagulation abnormalities or have serious cardiac disorder. You have no underlying medical disorders and you are in an overall healthy condition. You have a positive expectation with the end result of this cosmetic procedure. How does the Twin Polar (Mono & Bipolar) Radiofrequencies procedure works? The Twin Polar Radiofrequency instrument is an advanced and innovative piece of cosmetic machinery. It basically works by generating an electric field which switches its polarity (from negative to positive). This causes the molecules to rotate faster and generate heat. In this, mono polar (also known as Uni-polar) radiofrequency, is used to generate heat on the outer skin, while the bipolar radiofrequency generates heat in the tissues located at the lowest levels under your skin. This is aimed at the adipose tissues which are situated in the lower layers of your skin. This procedure is used to target your facial region mainly, and remedy various ageing problems caused from facial laxity to cellulite production. The procedure requires the cosmetic specialist to apply special oil on the skin of the targeted areas which require anti ageing action. The hand-held instrument is then moved to and fro over the area smoothly. Although the time required to treat a particular area differs from patient to patient, this is a significantly short non-invasive cosmetic procedure. Once the procedure is completed, an aloe vera gel is then applied on the treated areas. This further helps to cool the skin, and leaves no scars, marks or swelling after the procedure. Once done, you can usually resume normal everyday activities the same day. How effective and successful is the cosmetic Twin Polar (Mono & Bipolar) Radiofrequency procedure? The best results are noticeable after only a couple of session with the Twin Polar machine. In very rare cases are more than 3 session required for satisfactory results. The particular radiofrequency is able to advance the natural production of collagen fibers under your skin. This gives firmness to your skin, and removes the sagging skin. It is also effective in increasing the blood circulation in your treated skin and to improve the metabolism of your dermal cells. 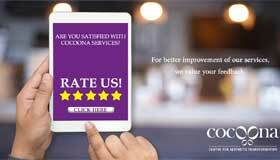 At Cocoona Center for Aesthetic Transformation, our team of expert cosmetic specialists is well adept at providing world-class aesthetic solutions in India. Using our extensive experience and highly advanced cosmetic instruments we are able to provide the best and most affordable Twin Polar (Mono & Bipolar) Radiofrequency procedure to every patient.